I've already completely changed my daily routines and, like a cat suddenly taken from her environment, I'm lashing out by hiding in the corner, hissing and clawing at the air. Metaphorically speaking, of course. I would never do that. Nope. Not in the silence of my room nor as I drive what seems like 500 miles a day to and from the old place to the new place to my first job from my second and stopping by my third. 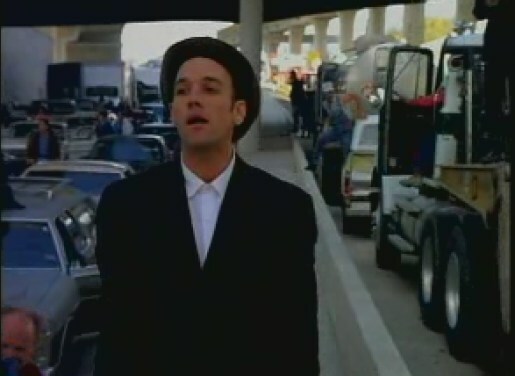 You'll definitely never find me clutching, white knuckled at my steering wheel, imagining a series of elaborate scenarios that would begin with me getting all Michael Stipe-y, exiting my car and calmly walking over and in between cars on the Southern State Parkway in the midst of rush hour traffic. I am not cut out for commuting by car. And I say this, not even one full week in to actually doing it regularly. I'm not at any kind of breaking point (yet). All I'm saying is that this afternoon it took me an hour to drive 30 miles, someone with exceptionally dirty arms threw an empty coffee cup at my car while going 65 mph and there is lately a mystery tapping that is coming from somewhere deep inside my glove compartment, a place too packed with plastic spoons, dozens of copies of my registration and enough maxi pads to ensure about two years worth of overnight protection. If I could somehow generate a metaphysical bumper sticker, it might read: I'd rather be doing literally anything else. It wasn't until I was 28 that I even got a driver's license and I'm beginning to realize that it may not have been a random circumstance. But I'm waxing on about this simply because driving has taken up 80% of my week. I knew what I was up against when I sort of decided to do what I quasi-decided to do. Overall, and some people in my real life might dispute this claim, I think I'm handling the changes happening with as much dignity as I can muster. I'm not adopting a totally Buddhist mentality of no attachments but I'm not shitting and vomiting in my carrier, the way my cats did when I drove them to their new home on Saturday either. Honing my focus on one task at a time, one day at a time is my new goal. Its absence has had me adrift for a long time but I'm determined now to throw down my anchor. There's an app (or several) to help. Right now I'm listening to one as I type this. It reminds me of M83 and this song (which I'm pretty sure is antithetical to the purpose of a focusing app), the listening of which is going to be my break as soon as I finish...ok fine, let's listen to it now! The stars and planets are calling me a billion years away from you. One day at a time is what's keeping my own head above water right now and it's a good path to be on for the first little while. Sorry to hear your cats had some issues. Ugh!